Tamperproof Notice Boards: Do you need to securely display your parish church news and notices ? Ideal for use in entrance ways, church foyers or church and village halls we offer a large range of Internal use Tamperproof lockable Notice Boards. 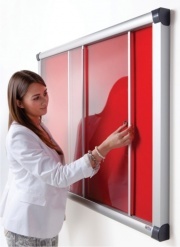 Suitable for use in indoor locations these wall mounted Notice Boards come in many different sizes and colours. From Sliding Door anti-tamper Notice Boards which are ideal for use in Corridors to Lift Off Door anti-tamper Notice Boards which can be banked together to form large information centres. We supply Tamperproof Notice Boards in different Frame Finishes or insert options. 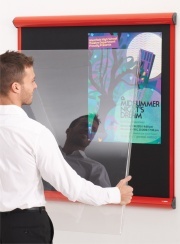 Being lockable our Tamperproof Notice Boards are an ideal way to control your information displays and Poster displays and be able to change your displays easily and quickly.